You can truly enjoy spending time outdoors by installing a custom built patio or porch in your property. They not only extend your livable space, but also improve your property’s overall appeal. Patios and porches are some of the best spots to experience what outdoor living should be. While porches and patios are already excellent landscape amenities, they can still be improved in terms of functionality and aesthetics. One way is through the installation of patio enclosures or screen for porches. And if you want them installed on your property, hire the state’s most trusted contractor. At Preferred Outdoor Designs, we have completed numerous installation projects involving patio enclosures and screen porches. The ones we’ve built are noted for their stunning beauty and utmost functionality. They are also highly durable, which allow clients to benefit from them for a very long time. We urge you to call us today so we can discuss your design ideas for your enhanced patio or porch. We service Louisville, Middleton, Anchorage, Lake Forest, and surrounding areas. As experienced builders of patios in residential and even commercial properties across Kentucky, we also know how to install functional, attractive, and sturdy enclosures. We can customize the designs based on clients’ preferences. We use only the finest materials to build patio enclosures – glass, wood, vinyl, aluminum, and the like. These enclosures are highly recommended for attached and stand-alone patios as they keep the patios safe from the elements. A patio enclosure offers a lot of benefits to the property owner. For one, it dramatically improves the functionality of the patio. You can use the area for rest and relaxation, quality bonding time with your loved ones, and even for special occasions. A new living space is also created without spending too much on renovation. Lastly, you can now enjoy your outdoor living space any time of the day, regardless of the season. If you want to make your porches attractive, long-lasting, and functional, you should consider having screens installed. At Preferred Outdoor Designs, we provide value for money screen installation service. When you hire us, you are guaranteed to have screens made from durable materials that are also attractive for a complete package. We can use a combination of high-grade screens and your preferred materials to achieve your desired appeal and functionality. 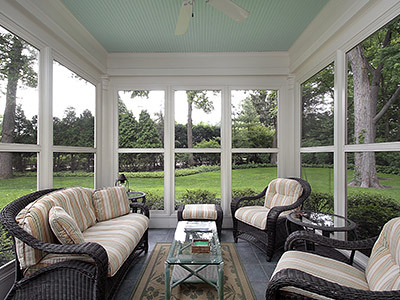 The materials that we typically use on screen porches are fiberglass, vinyl, and aluminum. The great thing about screened porches is that you can still have a clear view of your landscaping. The screen will also protect you from disease-carrying insects and outdoor elements. Dial (502) 245-3997 to know more about the patio enclosures and screen porches that we design and install. Our installation team is composed of well-experienced installers, so we can guarantee quality workmanship and attractive enclosure or screen. Don’t worry about our rates since we offer client-friendly pricing for all the services we offer. We even provide free cost estimates to let you prepare the right budget for your patio enclosure or screen porch.